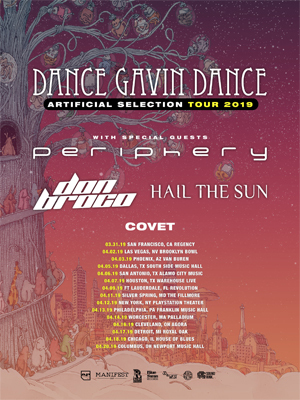 PERIPHERY join DANCE GAVIN DANCE for a 15 date North American tour this Spring, kicking off on March 31 at The Regency in San Francisco. The outing marks PERIPHERY’s first tour dates for 2019 and comes as the band recently wrapped up recording their as-of-yet untitled sixth album. Joining PERIPHERY and DANCE GAVIN DANCE are DON BROCO, HAIL THE SUN, and COVET. Tickets for the newly announced dates are on-sale this Friday, Jan. 11 at 10 am local time. PERIPHERY released Periphery III: Select Difficulty in the Summer of 2016. The 11-track release earned the band their first Grammy nomination, with a nod in the “Best Metal Performance” for the album opener “The Price Is Wrong”. PERIPHERY is Jake Bowen, Matt Halpern, Mark Holcomb, Misha Mansoor and Spencer Sotelo.